In the Fifteenth Century, Europe saw the dawning of a new era: the Renaissance. And the heart of this awakening in Italy was the beautiful city of Florenza. As the head of one of these ruling families, you must sponsor the greatest masterpieces of Italian art to assure that your family earns the most glory and prestige. Over eight rounds you will compete against the other families to sponsor the most important works. Once the workers are assigned, the real work can begin. Each workshop produces, in order, providing whoever sent a work there with goods or coin. Then, at last, art can be created. To create art, you need an artist and the specific combination of resources required for that creation. Provide the artist what he needs, and your family will earn glory and prestige. Miscalculate, and you will bring shame on your family name! The city politics of Florenza also play a role. You can earn the title of "Captain of the People," who can throw artists or workers in jail. Or take the path of the "Bishop," and convert your opponent's workers to your cause. The gain and loss of these offices also alters the turn order, which can evolve over the course of the game. If you can best balance the needs of your estate with those of the greater city, and if you can secure the funding and resources that the greatest masters require, you will find your house showered in glory, and victory shall be yours! 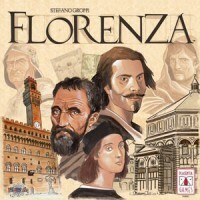 Add a Review for "Florenza"
rules in English, German, and Italian.